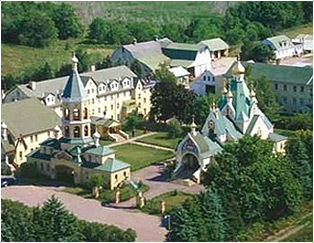 On Monday, December 21, the funeral of Archimandrite Joasaph was held at Holy Trinity Monastery presided by Bishop Gabriel of Montreal and Canada, Bishop Peter of Cleveland and Bishop George of Mayfield. 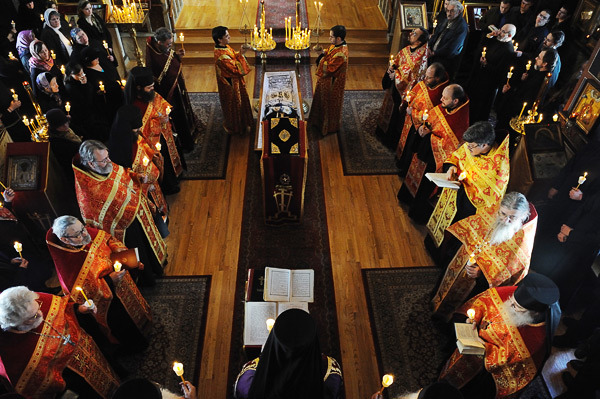 Numerous clergy and laity paid their last respects to Archimandrite Joasaph and prayed for his repose. Archimandrite Joasaph touched the lives of many by his love for the Church and zeal to help others, both as a layperson while involved in teaching and even more so as a priest who was entrusted with the leadership of the Russian Ecclesiastical Mission in Jerusalem. He left a bright career in academia to serve more wholeheartedly the Church and although the Lord took Him after one year since his ordination to the priesthood it was as if his desire to serve was fulfilled. Archimandrite Luke told him a few days before he reposed that God looks at the intention of the person and counts it as if it were fulfilled. The last few months of pain and suffering made Fr Joasaph concentrate even more on preparing his soul to go to Christ by sincere confession, repentance, communion of the Holy Mysteries, prayer and trust in God's will and providence. May his sacrifice of a worldly career, his love and sincerity for people, his patient enduring of his sickness, his desire to serve the Church, inspire us and warm our hearts who so often get involved with the cares of the world and forget about the one thing needful - to prepare our souls for the life to come. To the family of Fr Joasaph we offer our condolences but we also say that blessed are you to have a son, a brother, who was granted a blessed ending with hope in God's mercy. For the cancer of the body brings forth a renewal of the soul unto salvation when borne with patience. May our Lord and Savior Jesus Christ grant rest to the soul of His servant, Archimandrite Joasaph among the righteous.